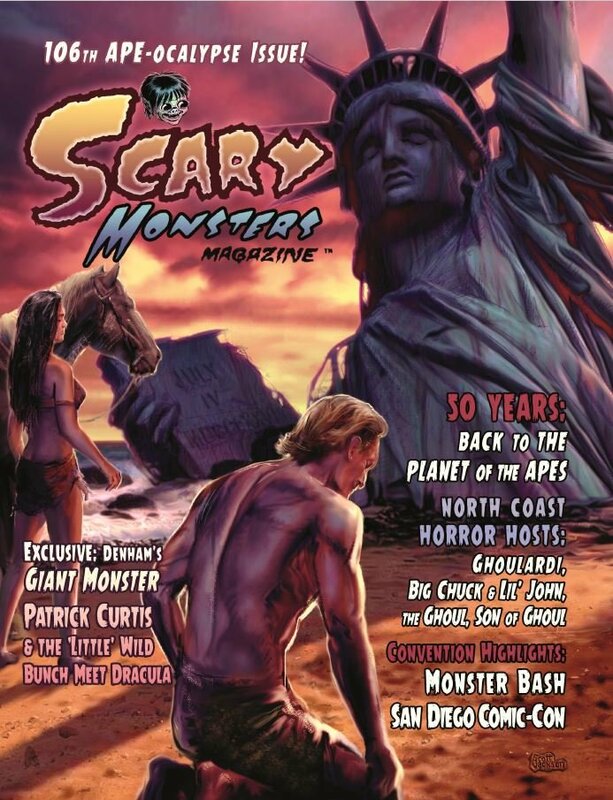 Scary Monsters 106th APE-ocalypse Issue! Also available at Barnes & Noble and other bookstores and comic shops. 146 pages of scary fun! In a spectacular, simian-inspired tribute to the 50th anniversary of the original Planet of the Apes film, our Scary Monsters 106th APE-ocalypse Issue includes "The Apes of Wrath," an in-depth look back at the landmark film series, and "Planet of Primates," which is a "behind the cages" analysis of the science underlying the films. This 146-pulp-page APE-idemic issue also includes: an exclusive sneak peek and "making of" article on the stunning stop-motion short film Denham's Giant Monster. Actor and film producer Patrick Curtis tells the true tale of trick-or-treating at Bela Lugosi's house in "Count Dracula vs. The 'Little" Wild Bunch." The scary spotlight returns to a long line of Northeast Ohio horror hosts, including Ghoulardi, Big Chuck & Lil John, The Ghoul and Son of Ghoul. ... as well as Scare Mail, Scareviews, Scare-News, Scary Stuff catalog, and much more! Full color wraparound cover art by Scott Jackson and vintage B&W content with 144 vintage pulp pages for Monster Kids of all ages! Published October 2017 by Rondo Award Winners and Monster Kids of the Year, Don and Vicki Smeraldi of MyMovieMonsters.com. Here is Dr. Gangrene's sneak preview of Scary Monsters #106!